When it comes to guitar effects, everything is quite tangled and difficult to understand. With the abundance of sounds and choices, it is hard to determine which one will be suitable for your music. It takes years of practice to finally understand what you want to do in terms of compositions and how you want to achieve the desired result. Pedals are those devices, that make that job quite easy. They allow you to experiment, layer different effects on top of one another and create something completely unique. Speaking of which, phaser pedals will become your best friend if you want to add a touch of something to your sound but you are struggling to determine what that something should be. It is crucially important to choose the best phaser pedal wisely, because it can improve and ruin your sound equally. Learn how to phase it up and you will become a true guitar virtuoso. Right off the bat, Empress Effects Phaser has too much to offer. When you take a look at this bad boy for the first time, it makes you question your whole existence. It is drenched in various controls and features. Seems like Empress took everything musicians ever wanted and combined it in one pedal. It is not that common for a phaser pedal to have adjustable waveforms, but this is not the case with this one. With a twist of a single knob (labeled as Waveform), you can pick out 8 different waves, each of them offering individual characteristics. The Blend knob mixes up your dry and wet signals, Speed/Ratio modifies the rate of the effect, while Width and Gain control the fluctuation of audio waves and overall output of the pedal. 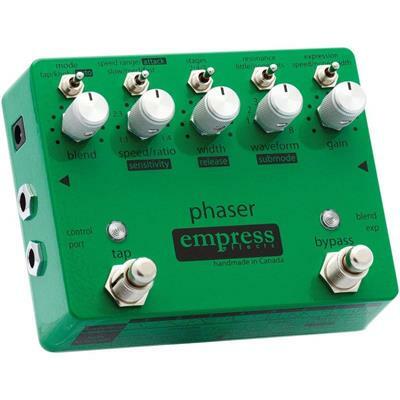 Apart from the knobs, Empress Effects Phaser features 5 toggle switches (Mode, Speed Range/Attack, Stages, Resonance, Expression). This pedal delivers a jaw-dropping experience right at your feet. MF103 Moogerfooger is an analog pedal, featuring all the benefits of this circuit. This pedal is basically divided in two parts: the first one controls the LFO (Low Frequency Oscillator), while the second takes care of the phase itself. LFO is monitored with the help of two knobs: the Amount determines to what extent the phase sweep is altered, while Rate modifies the speed of frequency fluctuation. You can even choose between Low and High ranges of LFO. Now, the Phase part has a couple of knobs as well: Resonance controls the higher margins of frequencies, while Sweep monitors their higher ranges. In addition, it allows you to choose between 6 and 12 stage phasing, which means you can select different circuits. In the middle, you will notice two more knobs: Drive adds gain to your sound, while Output blends together dry and affected signals. 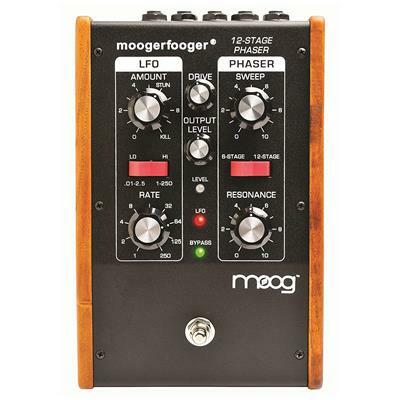 MF103 Moogerfooger can be controlled with expression pedal as well. In short, this is a great pedal if you are looking for something powerful with a lot of control at hand. 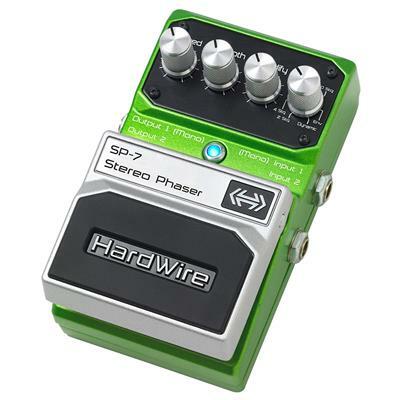 Digitech Hardwire SP-7 will deliver a great sound with just a simple set of controls. In order to avoid sounding like a broken record, I will not define the functionalities of Speed and Depth. This time, guess yourself what they are capable of. Now, the Modify knob can turn into bias, sensitivity and feedback controls depending on how you set it. Additionally, SP-7 offers an array of modes to choose from. 2STG has vintage vibes, 4STG delivers early Van Halen’s tones, while 10STG offers an intense swoosh in phaser sound. Apart from these, you can shift from Boutique to Modern and from Envelope to Dynamic. SP-7 has one more cool feature, namely Tap Tempo. This simple control sets the speed of your effect in a timely and rhythmic manner, offering you a lot of precision. Digitech did an amazing job with this pedal. Thumbs up from me! Walrus Audio Vanguard really stands out from the crowd, since it is equipped with two different phasers. The first one is a 10-stage phaser and has typical Rate and Depth controls. Additionally, it has Dry Mix knob, which controls the amount of dry signal cutting through the mix; Regen transfers affected tone back into filters; Wet Mix is basically a blend knob, mixing up dry and wet signals. A toggle switch allows you to select a four-stage (with added modulation), six-stage (with low-pass filter) and ten-stage phasers. These three are controlled with separate set of knobs: Rate, Depth and Tweak. What is more, you can save three presets and play them back anytime. 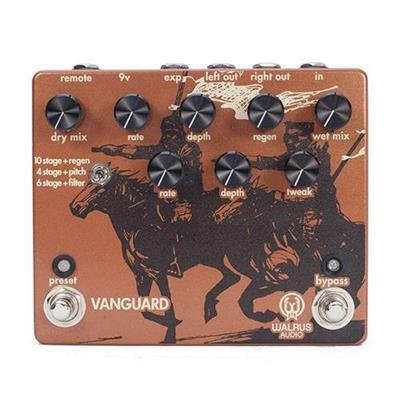 Audio Vanguard is definitely one of those pedals, that takes a lot of time, experimenting and tweaking to tailor to your preferences, but once you figure out all the features, you will be left with amazing sound and performance. Pigtronix EP2 Envelope is yet another super fancy pedal with an abundance of features and controls. It can be monitored either with Envelope or LFO (and in some cases with both). What makes this pedal different is its Staccato circuit. It is very responsive and can scatter the envelope in your sound beautifully. Rotary LFO Modulation can be controlled with Depth and Center. Another cool addition is the LFO Smooth switch, which decreases the resonance in your frequencies. 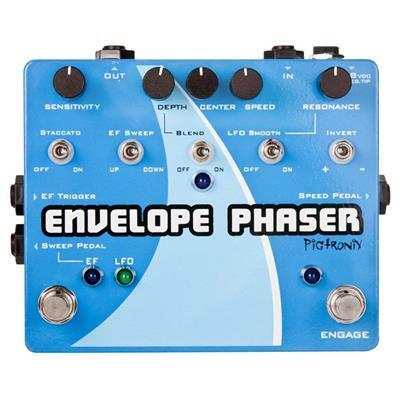 Envelope offers Speed, Sweep and external filter trigger inputs, which allow you to connect these pedals in your chain and deliver sweeping precise sounds. This pedal is built like a tank and will accompany you during your whole life. EP2 Envelope can deliver an array of different tones, ranging from subtle swirls to screaming sweeps. EathQuaker Devices Grand Orbiter gives you all the control you need. It comes with several knobs and toggle switches that might seem overwhelming at first glance, but trust me, they are very easy to tweak and adjust to your preferences. Let’s start with the basics: Rate controls the speed of the effect, while Depth modifies the amount of phase added to your sound. The latter can also act as a Volume control in Vibrato mode. Speaking of which, you can choose between aforementioned Vibrato and Phase modes (you basically get two-in-one deal here). Back to the knobs, Sweep controls the peak of the frequencies, while Resonance monitors the rejuvenation of phase shifting. Another toggle switch shifts between three rate modes: Rate 1 drags your sound in slow mode, Rate 2 allows the pedal to act as a resonant filter by disabling the LFO, while Rate 3 lets you dive into fast mode. Due to so much control, Grand Orbiter is quite flexible and adjustable to your taste. What else could you wish for? When it comes to TC Electronic, you cannot avoid praising the versatility they offer. Their free app gives you an array of options without overcomplicating the pedal itself. Helix is no exception and can be connected to the app for achieving maximized results. It comes with four simple knobs: Speed and Depth do exactly what their names indicate on and are quite typical controls in phaser pedals. Things get more interesting when you start tweaking the Mix. It blends your dry signal with the effected one and creates a more unique tone. Feedback accentuates peaks in your frequencies, making them more defined. 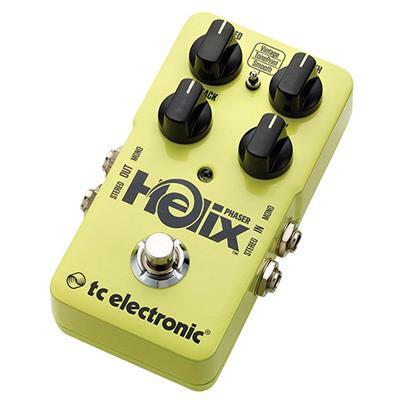 Additionally, Helix comes with a toggle switch, which allows you to shift between Vintage, TonePrint and Smooth modes. This pedal offers a lot of control over your tone, letting you to add presence to it. If the original Small Stone was too big for you, this nano version will be just the right size. It offers all the features of the initial pedal, but in a more compact design. Small Stone Nano delivers thick phase effect with a lot of transparency and it does this with the simplest controls. It has Rate knob, which allows you to switch between slow and fast shifting. The Color toggle switch adds a lot of character to your sound. In the upward position the phase shifting is more defined, but with the opposite settings the effect is quite full-bodied. When toggled up, you can easily discern the phasing and shifting of harmonics creating this beautiful effect. Compared to the original Small Stone, the Nano version offers brighter sweeps. All in all, this is a wonderful pedal for the price. Have you ever sat there listening to Van Halen, wishing you could sound just like him? Have you spent years practicing to get all the tones right? If so, I have good news, my friend. MXR EVH90 will make this process so much easier and effortless. This pedal was created in collaboration with Eddie himself, meaning it features everything this guitar virtuoso desired. It is very simple to control: you will see only Speed knob on the interface. It controls the rate of the phase effect. Unlike classic Phase 90, EVH 90 has additional Script switch, which allows you to travel back in time and go from old-school vintage phase to a modern one. If you are looking for something simple, yet powerful and unique, this signature pedal will definitely find its way in your pedal board. When it comes to Behringer, the first quality that catches your attention is its affordability. 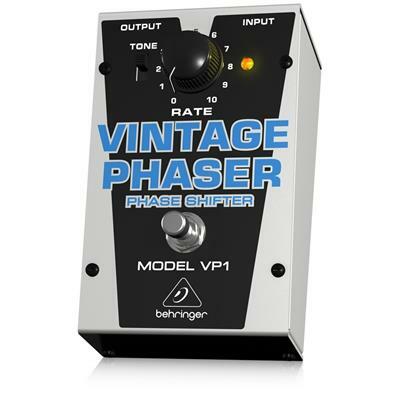 Vintage Phaser VP1 will cost you such a little money, you will not be able to believe that you are purchasing a device. It cannot get simpler than this: Vintage Phaser has one big knob (labeled as Rate), which allows you to set the speed of the effect effortlessly. This pedal has a Tone switch, which adds presence and definition to your sound in upward position. Keep in mind that it can color your tone. In downward settings, Tone allows for slow sweeping without changing your initial sound. When it comes to the performance, Vintage Phaser delivers warm, vintage tones that can be heard in Pink Floyd’s “Breathe”. It offers everything from subtle phaser effect to a harsh helicopter swirling. 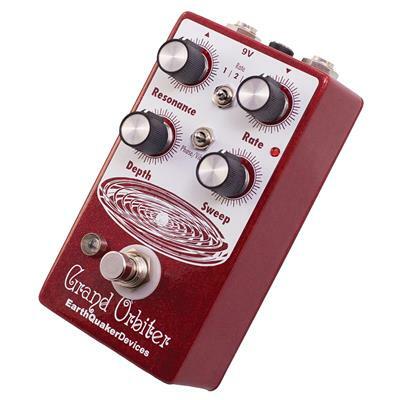 Considering the price, this pedal does everything it is supposed to and improves your sound in a deliberate manner. Back in the day, flanger was often referred as phase shifting in records such as “Itchycoo Park” (1967) by Small Faces. Later, in 1968, Fumio Mieda created a Uni-Vibe effects pedal which combined phase shift and chorus effects. This creation led to the popularization of phase shifting among a lot of leading musicians including Jimi Hendrix and Robin Tower. The important advancement happened in early ‘70s, when this effect was incorporated in a stompbox. 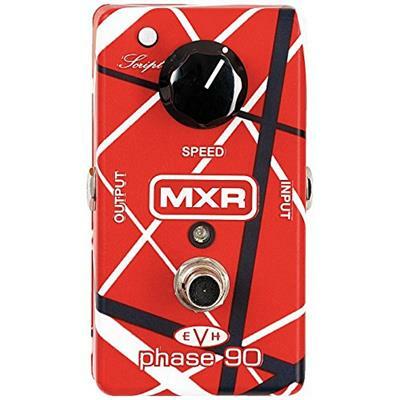 One of the first phase pedals was MXR Phase 90, often utilized by Eddie Van Halen (ultimately resulting in their collaboration). He was not the only one, though. Later on, Brian May (“Sheer Heart Attack) and Jonny Greenwood from Radiohead (“Paranoid Android”; “The Tourist”) often relied on this effect to add a unique touch to their music. Nowadays, when quite a lot of time has passed after phaser’s first steps in music history, we have an abundance of pedals offering this effect. Each of them are unique in their own way and allow you to crank your sound up a notch. In order to fully understand this effect and figure out the best ways of using it, let’s dive into little details that make a big difference in the final end. The biggest part of phasing the sound is the signal processor. It picks up the tones produced by your guitar and splits them up. One of the sections goes through multiple all-pass filters, which are also known as stages. The second part of the signal is left in its pristine condition. After passing all the stages, the parts are put back together, which creates peaks and throughs in the frequency. Each of them has a varied phase and blending them together produces a sweeping effect. Some of them are completely out of phase, which creates a dip in your sound. But when they are in phase, they produce spikes. These two blended together is where the magic happens. 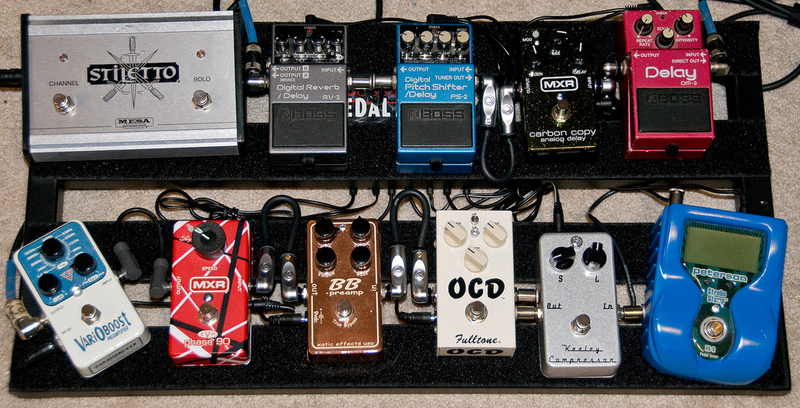 Typically, phaser pedals can have 2, 4, 8, 10, 12 stages. The bigger the number of the stages, the more filters your signal will pass. This varies the amount of peaks and throughs in the frequency. To calculate this number, you should simply split the number of stages in two. Basically, more stages mean more width of phase. However, different circuits respond to the quantity of filters differently. For instance, a two-stage pedal from one brand might do exactly the same as 4 stage one from the other. Stages are not exactly audible and they are mere mechanisms that contribute to creating phasing effect. This information will help you understand what the stage adjustment knobs do and how they alter your sound. This might be especially interesting for beginners, but sometimes even the professionals neglect the technicality and jump into performance. In my book, understanding even the smallest parts of your pedal will allow you to grasp what you are doing to its core. It is crucially important to know how to use your phaser pedals. Just as with many other effects, improper utilization can result in destroying your sound. All your effort made to saturate your sound with different characteristics will be in vain. If you want to avoid this unpleasant experience, just keep on reading. First things first, never get overboard. Too much effect is as bad as too little. I know how easy it is to dive into phase shifting and tweak your knobs interminably. But applying excessive amount of Speed or Resonance will result in uneven performance and deprive your sound of integrity and clarity. Finding your silver lining will depend on your instrument, the genre you play and how you play it. Speaking of which, typically, phasers are used with classic rock music in order to enhance solos, swirl them up or add some girth to them. Check the music of Eddie Van Halen and you will know what I am talking about. This guitar virtuoso basically reinvented the effect and changed the game drastically. Nevertheless, phaser pedals can be utilized with any type of sound if you figure out how to make it work. It will take you some time to match your phase shifting to death metal, but anything is possible. Now, a bit more about the music styles. Phasers do not really work that great with music played at fast tempo. In that case, this effect will just reduce the definition of a lot of notes. Distortion is not their best friend either, but overdrives benefit from phase shifting a great deal. The main thing is to match the fluctuation of phasers to your rhythm. If you keep this in mind, you will be able to achieve the result you were striving for. Just do not be afraid of experimenting! Last but not least, the parameter that will affect your sound the most is the tempo. Since phase shifting has audio waves and relies on oscillation, matching everything in time is crucial to create balanced tone. Imagine listening to something that has uneven rhythm and every part of the music is doing its own thing. I am pretty sure you would not enjoy that. Nowadays, many advanced pedals offer tap tempo, which allows you to do all of the abovementioned tweaking with just a tap on the switch. But if your pedal does not have this feature, you will have to set the speed (with Speed/Rate knob) yourself but it will take a lot of time and adjustment. All in all, phaser pedals are not that easy to use. Even the fanciest pedals with a lot of features require a lot of tweaking and experimenting. But when you think about the unique music you receive with the help of these pedals, all that fuss will fade away into distance and everything will seem worthwhile. It is true that you can produce phase effect even with the simplest pedal, but there are features, that make this process easier as well as give you full control over your tones. Let’s discuss some of them and determine, what features define your choice. I have already discussed the importance of adjustable speed and tempo, so we can skip over that part. I will just say briefly, that they are the prime features you should look for, if you love precision and accuracy in your sound. Many pedals offer tweakable resonance, which means that you can monitor the rejuvenation of phase shifting and set the higher and lower margins of the frequencies. This way you have a lot of control on hand and the opportunity to shape every single parameter in your tones. One more cool feature that takes your music to a whole new level is the Blend (sometimes labelled as Mix). It combines your dry and wet signals, meaning that your affected and initial notes will be layered on each other. This creates a unique sound that really stands out among others. The ability to switch between different types of phase effects will help you a lot as well. This provides you with a lot of versatility by allowing you to choose from vintage or modern phasers. In this case, you can be as adventurous as you want and play with various styles every day. Some might prefer straight forward pedals, but it is a good thing to have an option of changing your music. This is not very common, but several pedals let you choose between different waveforms. If you are a perfectionist and require a lot of accuracy, there is a high chance you will appreciate this feature. The more settings you adjust yourself, the more tailored your sound will be. We all want to see the reflection of ourselves in our music. We spend days researching about the controls and adjustments on different pedals so that we can tweak as many features of our sound as possible. This is due to our belief that the reflection of ourselves must be perfect. It does not matter which stomp box you will label as the best phaser pedal. The main thing is to create something of your own, a piece of music that is driven from the bottom of your heart. I believe that our mission as humans is based on that very principle. Go ahead, get yourself the pedal of your dreams and become a creator yourself! © 2019 Awkwardsound, All Rights Reserved.